Tony Greco, an acting teacher for 38 years, first worked with Philip Seymour Hoffman when the actor was 17 years old. That grew into a professional relationship that would span three decades and much of Hoffman’s finest work, including “Capote” and “The Master.” Greco spoke to Indiewire by phone Monday in New York. I knew Phil from when he was about 17. I never saw a kid who loved acting as much as Phil. His love of acting was as big as his complicated life. There always seemed to be an outlet for all the complexity of his life. What concerns me is the complexity of his life got bigger than what he could handle for acting. In my eyes, as an acting teacher, 46 years old is a young instrument. It’s not an old actor. I know in Hollywood it’s an old actor. That’s what’s really the tragedy to me. I worry that Phil started to believe his press. The Phil I knew never believed his press, was always constantly struggling. And then I think that maybe when you’re a young instrument and you have the talent that Phil had and the world throws at you what it started to throw at Phil… that’s a lot to handle. I think that’s part of the sadness of what happens to young actors. I think he started to think he was invincible. When Phil came to me with a great role, nothing was off limits. I could talk to Phil about any part of himself. Any aspect of his life. His love of the role was so big, his wanting to get to the truth of the part, that he was willing to journey to very complicated places. I have another student who I’ve known as long as Phil, Nicole Ari Parker, and she just did ‘Streetcar Named Desire’ on Broadway. And you can imagine that if you decide to take on Blanche DuBois, when the play is done you don’t go home and not think about all the questions that these great roles bring up inside of you. If you really decide to go where these great roles will take you, then you come out of them a changed person. You come out of them different because a great role… when an audience sees a great role, it should make them question their own lives. And when an actor takes on a great role, it should make them question their lives. They change. You could say one thing to Phil and he’d come back with a hundred different things. He was constantly digging. And then I think there wasn’t enough outlet for all of that. Studio film isn’t going to let you dig. When you get these great roles, that digging… there’s something about addiction, about obsession and great acting. I think if there were more outlets for Phil… that’s something I’m stressing to my students. If they want to go be on some sitcom on the WB, then they don’t have to dig too deeply. But if they really want to be actors, they really have to find material that can support all of the life that’s inside of them. I think he needed as much of that outlet as he could have. Look at Orson Welles. Or Marlon Brando. The energy turns in on itself. Creativity is a complicated thing. [As a student], he was really a mess, but an absolutely creative mess. He was always a mess. But he was also incredibly accessible — to other actors, particularly young actors. More than once I’d hear from a student, “I ran into Phil on the street, I said, ‘I’m in your class,’ and he talked to me about acting for an hour.” Incredibly generous about acting. How difficult the journey was for him, too. He’d never sugarcoat it, how complicated things were for him. Difficult to center himself, to dig into the role, to cope with the whole process. While he was very challenged and challenging, he also could… he was very rebellious against the process, but he’d also work toward it. And he’d share that with students. He’d share how ambivalent the process could be for him. That’s something that people who have achieved a great deal no longer share with young actors. There’s a need for people to think it was easy for them, and that they were touched by god. The real magical ones are the ones that have a bumpy road. When I started teaching him at Circle in the Square theater, he looked like he’d literally rolled out of bed and one eye would be on his cheek and the other would be on his forehead. But then he’d pick up a script and be unbelievably alive. And later, Phil had his ideas on scraps of paper, in his pocket, on his bicycle that you could see him riding through New York everywhere… you’d see him on his BMX bicycle on the street, he’d stop, and he’d talk to you about some great role. He was an old-fashioned actor in a certain way, and I mean that in the greatest of ways. I think that’s even why he died young. I think that… people like Monty Clift and James Dean, I don’t think that they were looking to die. I just think it was part of the way they lived their lives. It’s kind of like — people now don’t smoke or drink coffee or eat sugar because they’re going to live another day when they’re 97 years old. I certainly didn’t work with Phil on every project. I think Phil only worked with me on roles that he wanted to dig deeper, to explore why people did what they did, people who deserved a deeper level of respect. I don’t think he wanted to step into the role in “The Master” [in a general way]. I think he thought it was too important to get to why this man was what he was. He came to me with “Capote” because he owed Truman the respect to reveal why he did this very human thing. That’s something I really respected about Phil. 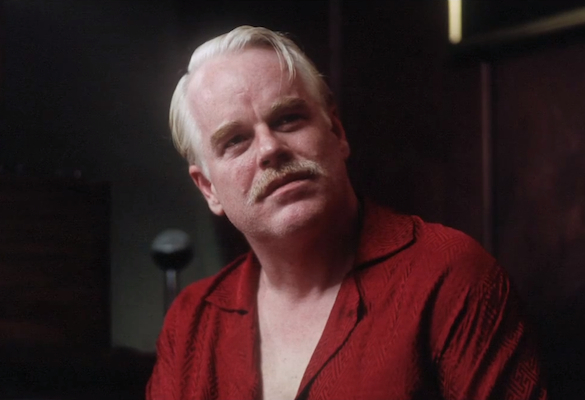 This Article is related to: News and tagged Features, Filmmaker Toolkit: Acting, Philip Seymour Hoffman, R.I.P.